Situated on a stretch of beach parallel to the railway line in Moratuwa, a suburb of Colombo, is a community living in very poor conditions. The prevalance of girls as young as 14 with their own children is caused by, and serves to reinforce, the poverty and vulnerability of this small fishing community. Child marriages and child motherhood are unexplored social problems in Sri Lanka, yet they place intolerable burdens on children, families and communities alike. The girls themselves face a severely curtailed childhood and education, a host of health worries and a general lack of social support in such areas. Shining Life Children’s Trust formed a 3-year partnership with a new local non-govenrmental organisation called The Organisation for the Empowerment of Child Mothers (OECM). Shining Life's role was to provide funds for the Angulana project and technical assistance in the design, management and monitoring of the project. OECM implement the project for young mothers, the long-term goal of which is to empower the child mothers of Angulana, by enabling them to participate more actively and effectively in the lives of their children and to improve their own circumstances. An integral element of achieving the goal is the immediate project purpose of raising their standard of living and well-being and that of their chuildren. 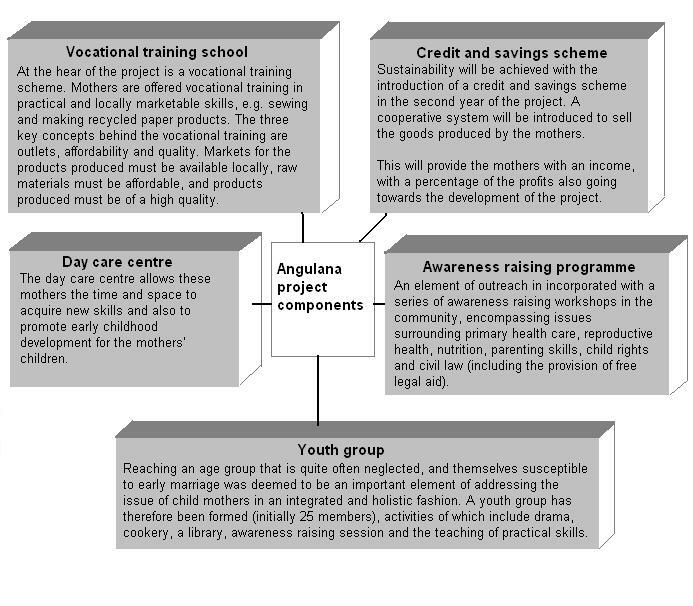 The project provides a truly integrated approach to achieving this; there are five components to the project (see the diagram below), all interrelated and all helping to build the future of the community. Thirty child mothers, aged between 14 and 19, were initially identified (in an area covering approximately a mile and a half and between 150 and 200 families) to benefit from the project. The intention was to reach 100 girls over the 3-year period, in the immediate area and beyond. The project was managed by a coordinator, who was assisted by a social worker and day-care teacher. Resource people are enlisted for specialist training and awareness raising programmes. The project objectives and activities were finalised, and continually reviewed, with considerable consultation with the beneficiaries, in the interests of transparency, accountability and adherence to the principles of participatory and sustainable development. The mothers were continually encouraged to identify and analyse issues that concern them, so that appropriate training and teaching can be given and resources allocated effectively.